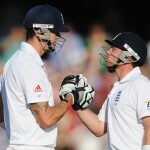 India 7-273 (Sachin Tendulkar 76, Gautam Gambhir 60, James Anderson 3-68) vs. England. Sachin Tendulkar and Gautam Gambhir smashed fifties and enabled India to reach a reasonable position as England controlled the day with accurate bowling. India lost their top four batsmen for 136 runs but scored 273 runs with three wickets in hand at stumps on the first day. The third Test of the four match series commenced on Wednesday, December 5, 2012, at Eden Gardens, Calcutta. MS Dhoni, the skipper of India, won the toss and straight away opted to bat on a wicket which looked like assisting the batsmen. The experienced duo of Gautam Gambhir and Virender Sehwag opened the innings as the first hit a couple of fours in the second over. 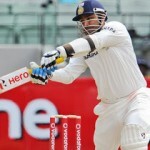 Sehwag also joined him with a few boundaries and the score was taken to 45 after 10 overs. Virender Sehwag ran himself out on the first ball of the next over for 23 as the batsman in- form Cheteshwar Pujara arrived in the centre. Gambhir was in a fine nick and was sending the ball out of the rope regularly as Pujara scored just three runs on the first 20 balls he faced and hit the first four two balls later. The second wicket partnership added 41 runs as Cheteshwar Pujara was clean bowled by Monty Panesar for 16 runs. The little master, Sachin Tendulkar, joined in next with Gautam Gambhir who scored his 21st Test fifty in the 26th over. The first hundred of the innings appeared on board in the 34th over as Tendulkar got the first four of his innings. He added another 2 fours in the 41st over as Gautam Gambhir was caught by Jonathan Trott in the slip off Panesar for 60 scored from 124 balls with 12 fours. The discouraging form of Virat Kohli continued in the series when he was caught by Graeme Swann off James Anderson for just six runs. India was in some sort of trouble by losing their fourth wicket at 136 in 48.4 overs when Yuvraj Singh joined in with Tendulkar. Yuvraj Singh hit two back to back fours in the 52nd over and Tendulkar followed him in the next over. The little master was playing a fluent knock and achieved his 66th Test fifty with a four on the first delivery of the 59th over. That was the first fifty by Tendulkar after 10 innings since he last scored 80 runs on January 6, 2012, vs. Australia at Sydney Cricket Ground. He faced a miserable touch with the bat later on and managed just 15, 8, 25, 13, 19, 17, 27, 13, 8 and 8 runs in the following innings. Yuvraj Singh dispatched the first six of the innings on the third ball of the 60th over as the hosts reached 200 runs four overs later. The pair tried to accelerate the runs rate and gathered nine runs in the 67th over when Yuvraj Singh became the next victim. He was caught by the English captain, Alastair Cook, off Graeme Swann for 32 runs as Dhoni reached in the centre. Sachin Tendulkar became the next victim when he was caught behind superbly by the wicket keeper Matt Prior off Anderson for 76 from 155 balls comprising 13 fours. India lost the sixth wicket at 230 as Ravichandran Ashwin associated with Dhoni, they tried to establish the innings and enhanced the score to 251 after 82 overs. They lifted the score to 268 when the stumps of Ashwin were uprooted by Anderson for 21 runs. The home side reached 273 for the loss of seven wickets at the end of the 90th over at the close of the first day’s play. Dhoni was unbeaten for 22 runs and Zaheer Khan has yet to open his account. James Anderson was the most successful bowler of the day with three wickets, Monty Panesar held two whereas Graeme Swann claimed one wicket. The match is evenly balanced at the moment and an addition of 75-100 runs to the score can consolidate the position of India whereas England will anticipate removing the tail at the earliest on the second day.